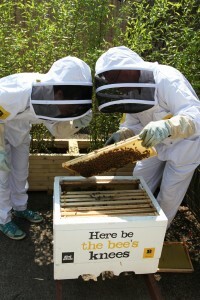 Abel & Cole is extending its ethical food adventure by joining us in an exciting new beehive management partnership. The company will house three beehives at their headquarters in Wimbledon, supporting urban beekeeping and helping to protect dwindling honeybee numbers. “Organic farming plays such a phenomenally crucial role in protecting biodiversity and, whilst we may not be farmers ourselves, we can still play a positive part in sustainable food systems. By offering a home to honeybees in our little bit of south west London, we can help educate each other and everyone in the Abel & Cole community of the important role they, and other pollinators play. The organic home delivery service was founded 28 years ago with the intent of doing good by supporting ethical food producers, whilst having fun. Like Abel & Cole, Plan Bee shares that ethos, working with businesses that not only care about good food, but also truly care about the environment.